A detailed sign welcomes you at the front of the log cabin at the Last Mountain House Provincial Park. The sign shows a layout of the cabins in colorful detail. A log cabin sits in the background with a flag in front of it. A green lawn leads up to the open door of the cabin. 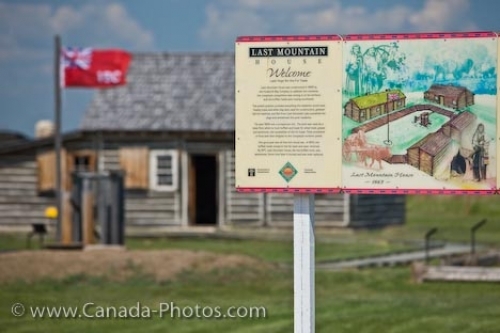 Large sign at and buildings at the Last Mountain House Provincial Park, Saskatchewan, Canada. Detailed welcome sign of the Last Mountain House Provincial Park, Saskatchewan, Canada.